In May of 1997 I attended my first meeting of the Los Ranchos Presbytery (in Orange County, CA). I was the just-recently elected Pastor of San Clemente Presbyterian Church and was warmly welcomed by my new colleagues. But what truly stands out from my first Presbytery meeting was that is was last meeting for retiring pastor George Munzing of Trinity Presbyterian Church in Santa Ana. George had served at Trinity for over 30 years and I remembered thinking as a roll call of people stood and offered tributes and blessings that 30 years was a very long time. I can’t possibly know or say whether I will be called to San Clemente for three decades or more, but what is apparent to me 7 ½ years later is the tremendous difference that a long pastorate (and deep, enduring relationships in the church itself) makes--especially in the most stubborn areas of discipleship. Today, San Clemente Presbyterian Church and Trinity Presbyterian Church are pretty similar. We are both about the same size (approx 1200 members), with the same worship attendance (just under 1000 worshippers a week), we draw from similar socio-economic strata of people, we have both undertaken considerable building projects and capital campaigns to go with them, we have similar evangelical convictions and commitments. In some ways, SCPC is enjoying a season of staff and pastoral stability that Trinity is not (all of their pastors are interims at the moment and they have had some considerable challenges of late.) But there is one very significant difference between SCPC and Trinity: The size of our ministry budgets. For the past seven years, no matter the ups and downs of their congregation, Trinity’s budget has been almost $1 million a year larger than SCPC. And the bulk of that money goes directly to mission work around the world. What is significant to me about this discrepancy is that SCPC is not a church of overly miserly, greedy people (not at all!). In fact, we are pretty normal for a growing church in a growing area with lots of newer Christian families. In many ways, we completely conform to the profile of South Orange County Christians in our charitable giving (most families give between 1-2% of their household income to the work of the Lord—which is exactly the county average according to most stats I have read). It’s not that we are so negligent, it is that Trinity, for all the struggles of the past few years, remains a most spiritually mature, solid and committed Christian community of people who have learned and take seriously the call to biblical stewardship and mission. In my opinion, this is a direct result of George Munzing’s long pastorate. Only as a pastor and a people together develop deep trust and have long conversations centered on living out the Scriptures are the most stubborn areas of our lives surrendered to Christ and his values. And let's face, nothing is more stubborn than stewardship. While Jesus spoke of our money and resources as the first arena of discipleship (see Matt 6:19-34, Luke 16:11-13), most of us agree with Mark Twain, that the last thing converted in a person is their wallet. Most of us recognize that biblical starting places like tithing 10% of our income to the Lord are now—unfortunately—considered by most Christians to be lofty “goals” that are rarely met. (In direct opposition to Jesus who seems to think that we should all commit far more than a tithe to the work of the Kingdom!) Stewardship, security, acquisitiveness, materialism, generosity, hospitality…these are very difficult issues for most of us and growth is usually slow in coming. When I see a church like Trinity and the fruit of a long pastorate and a committed Christian community who has hung together in good times and bad, give generously to the Lord’s work and understand that the Christian life is a “long obedience in the same direction” (to steal Eugene Peterson’s co-opting Nietzsche’s phrase). Then I am encouraged once again to sink the roots a little deeper and give God more time to work in all of us. A final note: This weekend, I won’t be blogging because I am speaking for Trinity Presbyterian Church’s Men’s Retreat on Friday and Saturday. It will be a privilege to be with even part of such an inspiring community. Today, I intend to bring this series on the spiritual discipline of "stability" or "staying put" to a close by offering this reflection on one word in the virtue list of 2 Peter 1: endurance and a quick link to an article in today's Orange County Register about one man who is patiently making a difference. But first the word study. That is the classic picture of endurance. It is that commitment that is willing to suffer anything for the cause of Christ. It is faithfulness that can both stand the fire and stand still, facing anything great or small. Let me ask you to consider something. If the government outlawed worship, would it stop us from gathering next weekend? I dare say it wouldn’t. We would certainly risk a fine or jail time to worship God, wouldn’t we? Of course we would. We know that we must be willing to face the fire. I’m confident that most of us would try to endure to be faithful to God. But here’s a conundrum. Why do so many of us, who would go to jail to worship God, stop coming to worship if the parking lot is too full, or if we don’t sing enough of the music we prefer, or if people aren’t as nice as we’d like them to be? If we are willing suffer for Christ, are we willing to be annoyed for him? If we are willing to suffer persecution for Christ, are we willing to suffer irritations? Interestingly enough, that is what this word endurance means here in 2 Peter. It means the commitment of a martyr applied to life’s everyday irritations. It is specifically about our demonstrating to other people the same patience that God shows with us. Endurance here is the quality of self-control applied to relationships. It is about having patience with people who absolutely annoy us. And for many of us, this is very difficult. Frankly, that’s why I don’t have a Christian bumper sticker on my car, because the way most people drive can cause me to act in very unchristian ways when I drive! I may be ready to act like a Christian when someone challenges my faith head on, but I often don’t when someone cuts me off on the freeway. This passage from my new book, Show Time: Living Down Hypocrisy by Living Out the Faith, gets to the heart of a "hanging out" faith: It takes work. Long, hard, patient work. "Staying Put" as a spiritual discipline is more a matter of endurance than anything else but the blessings of enduring far out weigh the effort. And for a great illustration of this kind of patient endurance, see my next post. But, since yesterday was Reformation Sunday, it seems only appropriate to bring this series on the “spiritual discipline of staying put” to a close with some random thoughts for when to know when it’s time to go. In this case, I am not talking so much about individuals leaving (I spent some time on that in an earlier post) but when churches split from denominations or when churches themselves split asunder. So, painful as it may be to consider, what can we learn from the reformation about when a church shouldn’t stay put. 1. Let’s start by saying that it shouldn’t be this way. Even we Protestants who sang our lungs out to celebrate Martin Luther nailing the 95 theses to the door in Wittenberg in 1517, need to acknowledge that it would have been way better if he hadn’t needed to. Maybe it’s because I was raised Roman Catholic but I really do believe (as the Reformers did) that 3rd century teacher Cyprian was correct when he said, “He cannot have God for his father, who has not the Church for his mother." (De Unit., c. vi). 2. One bad split begets another. That’s the biggest lesson of history and easily proved by simply thumbing through your local phone book under “churches.” When churches split, usually an entire generation of ministry is consumed with reorganizing, restructuring, realigning and then more often than not, another split comes on the heels of the first. So, we should be far more devoted to “reforming” then reorganizing, if we can be. 5. IF ultimately we end up splitting or leaving, it should be for one reason and one reason only: The witness of Christ will be better served by our splitting. I know that this is a difficult pill to swallow, but I believe that there are times when honorable separations serve the witness of God far better than the schisms and political power struggles that have so marked the church. In my denomination, we believe that there are times when individuals may need to leave the church, and have even added a footnote to our constitution that reminds people that in cases where we disagree we should be prepared “after sufficient liberty modestly to reason and remonstrate, peaceably withdraw from our communion without attempting to make any schism.” (See footnote in PCUSA Book of Order G-6.0108b. However, we still haven’t given provisions for congregations to do the same thing without losing their properties, so this all ends up being quite messy.) What I think that this means ultimately today is that before we head out the door to start our own church around our own ideas, take half the congregation to follow a new leader, form a new denomination, or start down the rode to a painful church split, we need to ask bigger questions than what any of us want or desire. We need to submit to God and seek what is best for Christ's witness even in our splitting. So, once again, I am agreeing with Abba Anthony in that even in our organizational lives, we should "not easily leave" the place that we find ourselves in. Indeed, unless we are faced with a clear scriptural rationale that would ultimately help the witness of the church, the more often than not, we should aim to stay put. If you have been lurking on this blog the past week, you know that I have begun a conversation about Christian community and the mission of Christ in the world, by considering the “spiritual discipline” of stability. Yesterday I told you that perhaps the most important lesson from seminary was learning that the “yous” are better translated as “y’alls.” That is, the “yous” are plural. Today let me make a more explicit connection on between the NT “y’alls" and stability: Y’all is where God dwells in this world. Most often when we talk about where God dwells, we think of a place. Indeed, even the Temple was an actual place. That the Jews labored to rebuild every time a conquering empire tore theirs down. But Jesus replaced the Temple in Jerusalem with himself and then promised that in the same way that he embodied the presence of God, his body the church would be the new temple. God doesn’t dwell in a place but with a people. The temple is not a church (building). The church (body) is the temple. Nice try. If you look at that verse in context it is talking specifically about the formal work of the church. The Church body is not just anybody we want to include. The Greek word for church means “gathering” and it irefers explicitly to the body of people whom God has gathered together, not us. And that is exactly the point of this passage. Notice that Paul didn’t say, “Look if you guys can’t get along break up into little groups of people who will get along. God will make all your groups into little temples.” No. Instead he insisted that they had to pull together as the one church whom God has gathered to be his temple. The Church belongs to God. It is his dwelling place and if whomever he includes it, we have to include, love, care for and be unified with. This is so important to God that in v. 17 we have one of the most strongly worded passages in the New Testament. If anyone destroys God’s temple, God will destroy that person. For God’s temple is holy, and you are that temple. God tells the Corinthians through Paul, that if they stop being a good, holy, and pleasing temple, he is going to tear it down. Just like the temple of Jerusalem that Jesus condemned, if we are not together as God’s dwelling place he will wreck it and go somewhere else. Whoa. This seems harsh. But why? Because God is not just with us for his sake or our sake. Which leads to our second point. God dwells with y’all for the world’s sake. Paul was so strict about the people of God in Corinth being a holy and unified body because they were God’s strategy for reaching the broken city of Corinth. And that is true today in your city and mine. A genuine alternative. We are meant to be a genuine alternative to the unbelieving, searching, culturally infected world around us. But we can only be that if we offer people the love, peace and unity of the Spirit that reveals the very presence of God with us. And, as you’ve been reading all that week, that takes, at the very least, hanging around and staying put. Tomorrow, I’ll wrap up this series of posts with some reflections on Reformation Sunday and when staying put is the last thing we should do. She also like to say “fixin’.” As in “I’m fixin’ to go to work.” A great phrase that told people that even while you are sitting on a couch drinking Diet Coke and eating Cheetos, you are still doing something. It may not be obvious what the action is, but fixin tell us of the potentiality of a person. One of our roommates who never had a job loved that word. He was always “fixin” to do something while he was doing nothing at all. If that wasn’t enough, Laura was convinced that God was from Mississippi but that most translators of the Bible were too prejudiced against southern folks to recognize it. A Wheaton College graduate, Laura had taken enough Greek to know that the biggest misunderstanding in the English language Bibles is that every one reads “You” as singular. However, as I have said before, but never with as much directness as I am today, in the New Testament, in the vast majority of cases, the “yous” are plural. In other words it would better be translated as the New Living Translation renders it “Don’t you realize that all of you together are the temple of God". Or as Laura would say, “y’all”. Now, I seriously doubt that God is from Mississippi (after hearing her describe the mosquitoes, I am not even sure he made Mississippi), but we west coasters and Yankees probably need some help from our southern friends if we are going understand the power of this passage and what I have called the most important thing I learned in Seminary. In fact, this one fact changed the whole way I read the NT: In the vast majority of cases the "yous" are plural. My friends, when you read the NT, try to overcome the bias that every verse is for you alone, when in actually it is for you and me and all of us together. Tomorrow, I’ll give you two points that I hope will help understand how the “yous” of the New Testament and the spiritual discipline of “Staying Put” come together. Readers of my book, Show Time, and members of San Clemente Presbyterian Church know all about my friends, Al and Enid. But as I write this week about the spiritual discipline of stability and the blessings of long relationships and deep Christian community, I want to tell one more story about them. It is personal, but it also offers all of us, clergy and laity alike a model of the kinds of commitments that make for a life-time of ministry and blessing. “Tod," Al said to me one day just weeks after my arrival in San Clemente, "Enid and I are committed to helping you and Beth have both a great ministry and a great life here in San Clemente. So whatever you need just let me know. Really.” That was about the most generous offer that I had ever heard. And you know what? He meant it. When Al agreed to be on the Senior Pastor Nominating Committee that called me to the church some 7 ½ years ago, he knew that it wasn’t going to be a commitment for 9-10 months, but maybe 9-10 YEARS. When Al said yes to serving on the PNC, he and Enid were dedicating themselves to serve and support whomever God brought as the pastor of the church. Over the years, Al and Enid have served our church in a number of ways, watched our kids many, many times so that Beth and I could have a regular date night, and provided meals, and friendship and partnership that is invaluable. They serve the church sacrificially, they love Beth, our kids, and me unwaveringly. Al is often the first person to point out when he thinks that something is not quite right in our ministry and always (always!) offers to be part of the solution and not just the problem. Sure, this was quite a commitment for two senior citizens who had already served the church faithfully for decades, but Al and Enid understand like few lay people the demands of ministry and the tolls they could take on a family (especially with really young kids like ours). Former youth leaders at another church, Al and Enid have seen literally dozens of their ‘spiritual kids’ become pastors and missionaries all over the world. And frankly, I think that is worth "staying put" for. 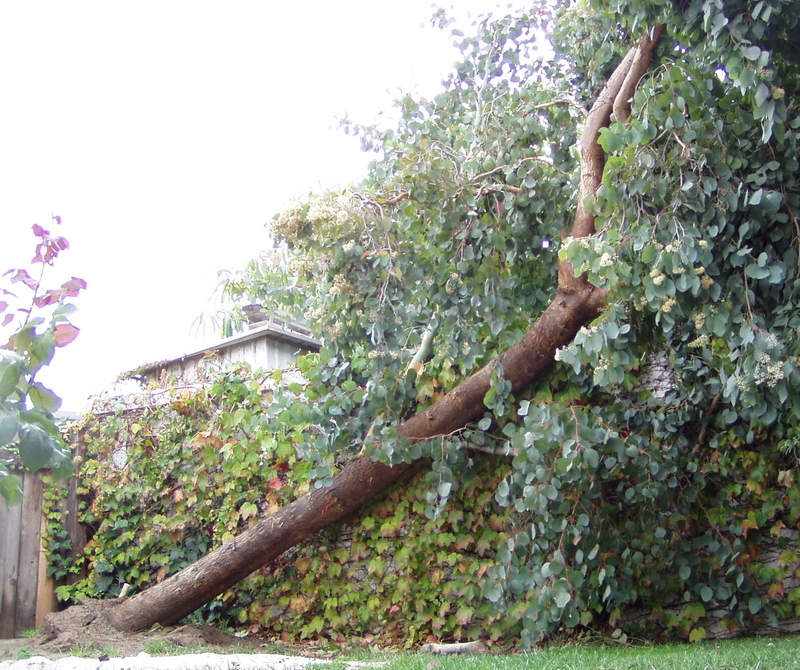 So I have spent all week blogging about staying "rooted" and getting "uprooted" and writing about trees that fall in storms... So guess whose big Eucaplytus tree took a powder in the windstorm last night? In 1989 I was asked to start a ministry at First Presbyterian Church of Hollywood for young adults in their 20s and 30s which we later called BRICK (Building Relationships in Christ’s Kingdom). To get it going, I contacted Lou. Lou seemed perfect for this ministry. He was in his young 30s, seminary educated, successful, single, had lots of time. He could easily share with me the teaching load and leadership tasks. I told him about the need and asked him to join me. He agreed that a church like ours should have such a ministry and so we decided to start a fellowship group. We started with over 50 people but by the end of the first year it had dwindled to 18—and a number of them were extremely needy people. After the first year, Lou was offered a different career opportunity that allowed him to gracefully bow out of our struggling ministry. I was now faced with finding a new president for the class. One woman in the group, Lisa, seemed the best hope. She was naturally sweet and kind; she was friendly but a bit shy. I figured she would be a good fill-in until I could find a more charismatic leader. When I asked her if she would be the class president, she told me that she wanted to pray about it. A few days later she told me that she felt that God was calling her to be the class president. I must tell you that I didn’t pay much attention to her use of the word “Call”. I simply thought it was just a Christian cliché. But a few months later, with the class still struggling along, Lisa came to me and told me that she had a chance for a big promotion in her work, but it meant moving across the country. Knowing that Lisa had moved to LA for work, I assumed that this meant that if she was offered the job then she was leaving and that I would need to find yet another president for my limping class. I wished her well and figured that was that. A few days later, Lisa called to tell me that she had been offered the promotion, but had turned it down. When I asked her why, she said, “Tod, I really believe that I was called by God to serve this class.” At that time, so very aware of what it had cost her, I heard the word, “call”. Slowly the group began to flourish under Lisa’s leadership. 2 years later when she turned over the class presidency, it averaged 100 people a week and was on its way to being one of the strongest ministries at FPCH. I believe with all my heart that the difference between Lou’s ministry and Lisa’s was that Lisa new herself to be as called by God to that ministry as any pastor. For Lou the ministry was a burden and struggle, for Lisa it was an expression of her faith. For Lou, the ministry was a chore, for Lisa the ministry was a call. God’s Spirit called Lisa to serve and then blessed that call. Lisa responded to the call by committing, staying, and investing. Lisa later married Scott, a wonderful man, and the both of them attend and serve at FPCH to this day. Joe is a western region salesman for a Cleveland based company who was recently offered a big promotion. It was his dream job, one he has been hoping for and looking forward to. However, it would have meant moving back to Cleveland. He and his wife discussed and prayed. They felt God was calling them to stay here … because of the growth in their spiritual lives because of BRICK. They felt like God wanted them to stay here for BRICK, so he declined the promotion! Lisa and I wept when we heard the story. I got a bit choked up too. I once interviewed for an associate pastor job with a senior pastor who told me that he and the church leadership were right in the middle of a conversation about his future as the pastor. He mentioned that he had been at the church for ten years and that it seemed like a good time to discern whether God wanted him to stay there or to move on. It was evident to me that the church had flourished under his leadership. What had been a struggling, hurting congregation was now a vibrant, caring community. He noted that his pastoral gifts were perfectly suited for a “turn around” church and that he wondered if they needed a different kind of pastor now. Then he said to me, “So the church leadership and I are trying to discern whether I should keep being the pastor here.” Then he turned and looked at a lay leader who was there and said, “Do you think I said all that right?” She nodded. I must tell you that at first this discussion freaked me out. I figured that something had to be wrong. Pastors never talk to church leadership about leaving unless they are getting the boot. Or do they? It turns out that this pastor had developed such a good, trusting relationship with the church leaders that they could have continual honest conversations about both the church’s needs and his calling. It's probably no surprise that this pastor eventually stayed at that church until the end of his life. Could this be a model for how a healthy community offers both stability and sensitivity to God’s leading? 2) In the same way that pastors are “called to” a church, they should only leave when “called away.” And I envision that that calling should include not just people from the new church, but also to an even more significant degree from the church that he or she is currently serving. In other words, for a pastor to move on there should be some process and discussion with the “sending” church, not just the new “calling” church. In the same way that we have Pastor Search Committees, why shouldn’t we have Pastor SENDING committees, who work with the pastor to discern when God may be calling him or her away? I also think that small groups in the life of a church could operate similarly for church members. Recently at a church lunch for our seniors fellowship, I was asked in a Q & A time what is the hardest part of ministry. My answer was: The hardest part of ministry is that people assume that I know when I have failed them. Very often I only find out after the fact that I have let people down, even to the point where they want to leave the church, without them ever telling me what I had done. I told these folks that I since I am committed to them for the long haul, I need both more patience and more confrontation. The only way we are going to keep going deeper with each other is if we keep the conversation going...bluntly and lovingly. Tomorrow I’ll tell you my favorite story of how God blessed a whole community of people because one lay leader was called to stay put…and the surprise blessing that came to her 15 years later. Since we live in a world where so many are so quick to leave any situation that gets at all uncomfortable, I want us to consider becoming people who are far more likely to stay too long in a challenging situation rather than cut and run the minute the church stops playing our favorite hymn every week. But if we take stability seriously, it does raise another question, “When do we leave?” Are there times to uproot and move on? Aren’t there experiences where we, like Abraham, are called to follow God to a new place, a new territory, a new call? But in the meantime, if you are interested in some further discussion about discernment and Christian decision making, let me suggest either one of my books in the left hand column. Because it is such a concern for so many Christians, I have written extensively about the subject of discernment and wisdom. In It Takes a Church to Raise a Christian, I give a pretty exhaustive theological and biblical account of Christian discernment as practiced in the early church. In Showtime, I offer some basic instructions in developing discernment and wisdom as part of genuine Christian character. Please let me know if these two books help your discernment of life’s challenges.